March 27, 2019 • Christy Hovanetz, Ph.D.
Everyone benefits when there is a simple and clear process to measure how well a school is performing. Balancing the needs of each unique audience, however, can be a challenge. Well-designed, state-level school accountability systems address a history of inequity while incentivizing schools to ensure all students graduate prepared to succeed. But state-level school accountability is hard to get right for technical reasons, for political reasons and for one reason that is perhaps even more fundamental: there are so many different stakeholders. For educators, an A-F grade can provide external validation to local- and school-level determinations about student performance. These include course grades and competencies achieved, and they differentiate effectiveness of schools, districts and providers in helping students achieve long-term success. The state school accountability system can help administrators determine the allocation of local resources, staffing and professional development needs. Policymakers can use the results to best allocate state resources, develop state policy and measure the critical need for economic and workforce readiness. Businesses can also use school accountability results to determine the supply of workforce to meet their hiring needs and the location to best fit their economic development strategies. Taxpayers can use a strong accountability system to hold policymakers and administrators accountable for efficient use of public resources. And, finally, parents need state school accountability information to make informed choices for their children’s education and to decide where to enroll their child, how to engage with the school and what support their child might need outside of school. Designing an accountability system for so many different stakeholders comes with unavoidable tradeoffs. 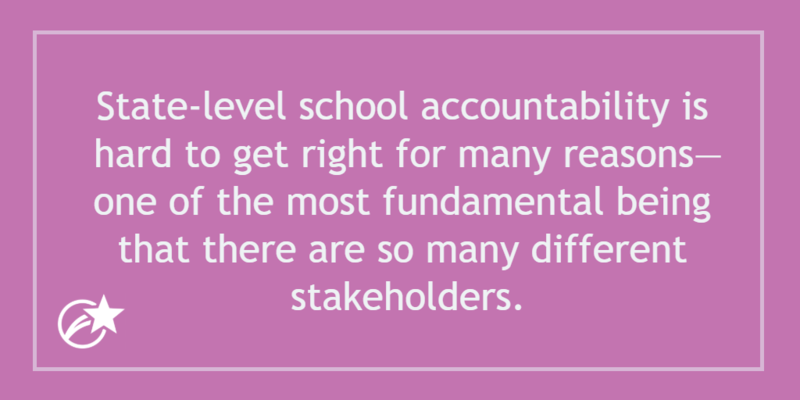 A decision to make accountability a more effective tool for administrators, for example, may make a report more detail-heavy and less accessible to parents and vice versa. Similarly, designing a system exclusively focused on identifying the lowest-performing schools may not give parents the information they desire to compare the strengths and weaknesses of various schools. At ExcelinEd we believe parents should be elevated to the top of the stakeholder priority list. For far too long, too many states have failed to prioritize parents. For evidence, we need only look to the contrast between parent perception and the reality of school performance. 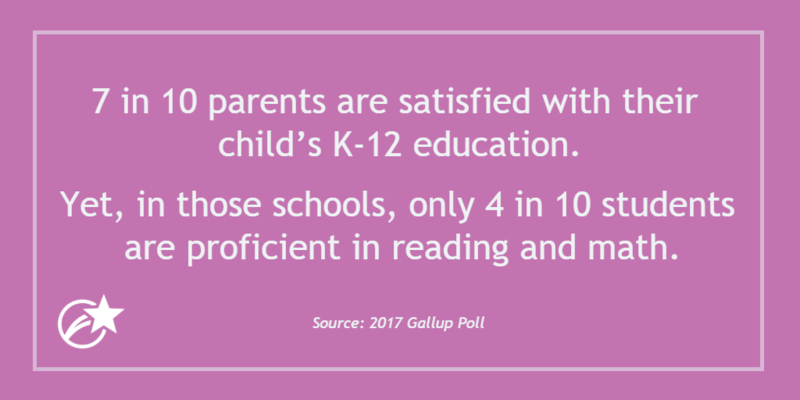 A 2017 Gallup poll found that 7 in 10 parents are satisfied with their child’s K-12 education, yet, in those schools, only 4 in 10 of our students are proficient in reading and math. As we look forward to the next generation of accountability systems, ExcelinEd encourages states to balance the needs of all stakeholders while prioritizing parent perspectives above all others. Learn more about School Accountability at ExcelinEd.org.